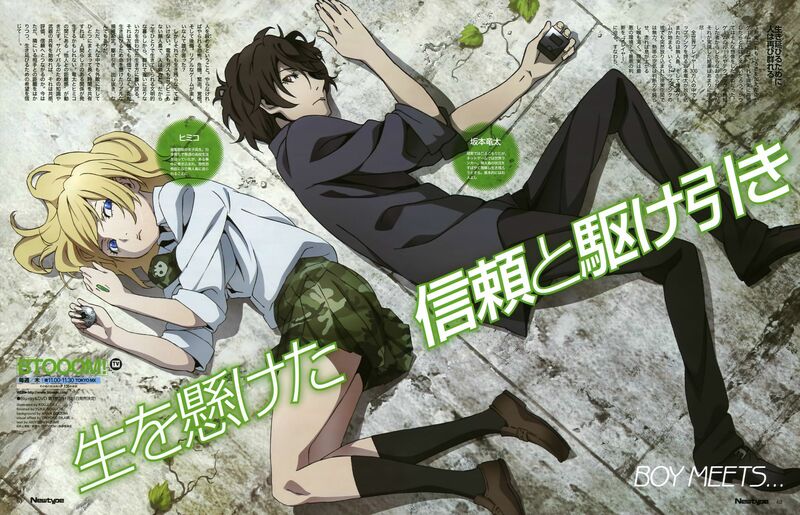 The bomb that will never detonate: Btooom! Originated from a manga, 20 volumes and still ongoing. Anime only had 12eps and covered only 50 chapters of the manga. It was great. The setting, the pacing, the storyline, the characters, it all reflects on pretty much on realism and it was just good. Everything was great, its just the ep count and also where they decide to end. It ended exactly where it starts to officially picks up. I hate this feeling a lot, it shows how incomplete and how Madhouse treat this series. Its an absolute waste of potential, this show could have been a good 2 cours. Animations by Madhouse, it was pretty good. Pretty awesome character designs, smooth frames and nicely colored and rendered backgrounds. Combat scenes were pretty nicely done too. Music is ok, I can’t really feel the OP and ED, but the BGMs were nice. VAs was quite a nice list. Hongo Kanata, Mimori Suzuko, Sawashiro Miyuki, Kuroda Takuya, Nakamura Yuichi, Narita Ken, Okawa Toru, Hikasa Yoko, Mikami Shiori. Nicely voiced and pretty awesome cast. Recommended for it being way more realistic than SAO, AccelWorld, Log Horizon etc etc, but beware for cliffhanger. The non-ending kind of kills this one. Really into it at then it just stops. Very little rewatch value without some sort of conclusion. Decent anime, although it is hard to recommend due to the non-ending. Deserves more than 2 seasons.